Cromer Beachcomber Guesthouse offers twin and double rooms for your stay in this friendly and beautiful seaside town. 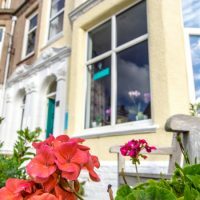 Look forward to a wonderful holiday with us in peaceful accomodation just a minutes walk away from the beach and a few minutes from the town centre! All our rooms are ensuite. We have a lounge on the ground floor for guest use. Our rooms are on the first and second floor but we do have ground floor accommodation offering B&B in our flat next door (which can also be rented out as self catering).